Transparent, robust and stackable. 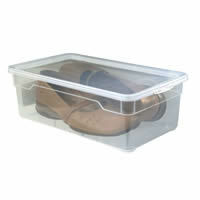 Our famous clear plastic shoe storage box offers a great way to store and display your favourite heels etc. 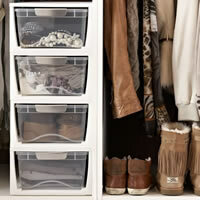 5 x Crystal clear stackable shoe storage drawers. 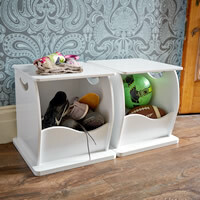 Don't waste time with those fiddly fold flat clear shoe boxes...Use our FABULOUS STACKABLE DRAWERS instead! 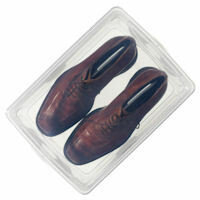 At last, we've finally found decent clear shoe storage boxes for men's shoes! Our FABULOUS STACKABLE DRAWERS are a great alternative to those fiddly storage storage organisers. 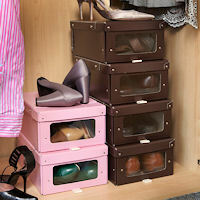 Robust stackable clear ladies shoe storage box drawers to organise your collection of killer heels. Stack to suit your space. Men's shoe box also available. 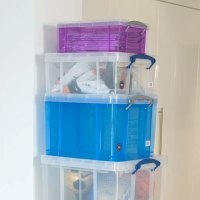 Robust stackable clear shoe storage box drawers to organise your shoes and clothes Stack to suit your space. 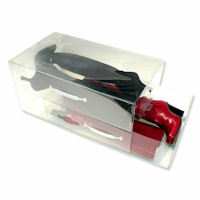 Smaller ladies shoe box also available. 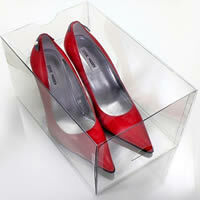 Set of two sturdy glossy card shoe storage boxes with transparent window so you can see and grab your favourite heels. As seen on Channel 4's The Home Show! 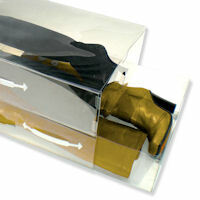 Robust transparent shoe boxes. 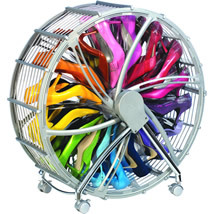 Stack 'em in your wardrobe for neater clearer shoe storage. 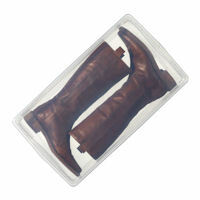 Clear plastic stackable shoe storage box with a sliding drop-front for easy access. 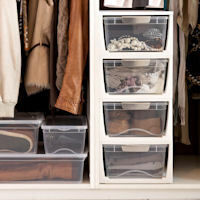 Set of three transparent stackable shoe storage drawers designed for high stilettos that won't fit into normal shoe boxes. 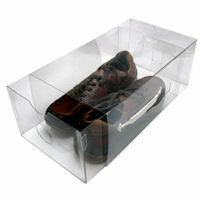 A great alternative to the traditional clear shoe box. SAVE NEARLY 60% OFF REGULAR PRICE! Grey fabric shoe storage box with pull tab front and clear window to make identifying contents easy. Grey fabric boot storage box with pull tab front and clear window to make identifying contents easy. 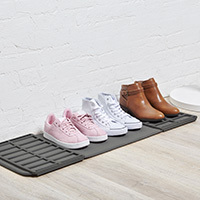 Ultra-absorbent foam fabric mat with built-in drying rack. 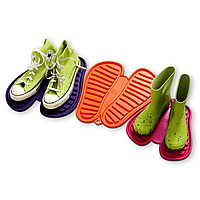 Helps shoes dry quicker, whilst keeping your floor clean and dry. Set of 3 clear plastic stackable shoe storage boxes with sliding lids to the front for easy opening and closing. 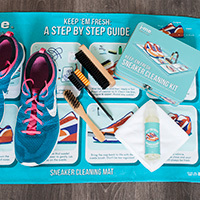 Trainer cleaning kit to help keep your Adidas Originals Yeezy 500's and Air Jordans in pristine condition. 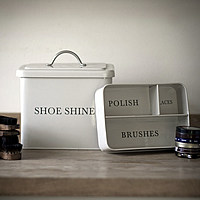 Traditional shoe shine storage box with a handy removable tray for all your bits and bobs. 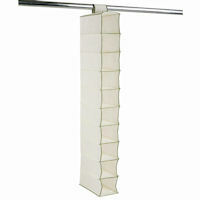 Ten pocket hanging shoe storage organiser in taupe coloured breathable Ultratex fabric with a neat green trim to hang below a clothes rail. 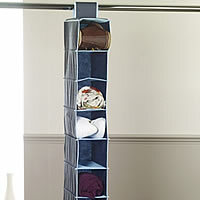 10 pocket vertical shoe organiser in blue with Velcro fastening to hang below a clothes rail. 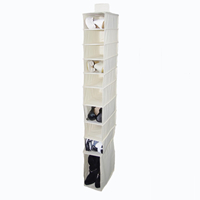 Hanging shoe and boot organiser in cream with a range of different sized pockets to clear the clutter of shoes from your wardrobe floor.